Well, it is up and running now after several months. Probably one of the larger projects I’ve ever taken on aside from my first house renovation. 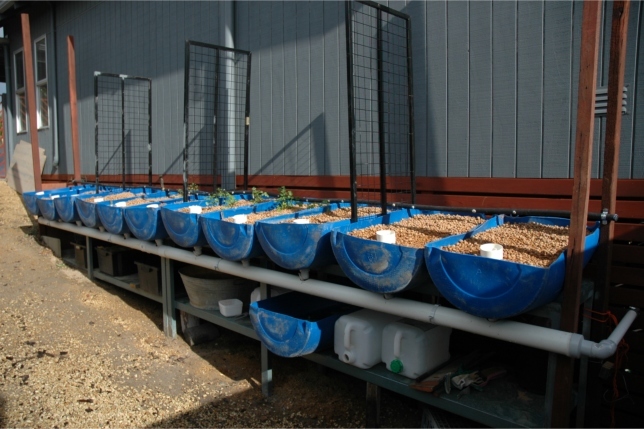 The outlet pipe (black poly pipe running the length of the grow beds) has required some tinkering and probably will for some time as the system settles and the bacteria begin to fill the beds along with organic matter. Most of the beds are filling around the same time and I have set a timer for the pump to go on for a half hour and then off for an hour. Alternating like this over the last day seems to work well and we had a stormy night and some rain last night and in the early morning and that hasn’t appeared to upset the water levels too much. I planted in some watercress and parsley seedlings some days ago and they seem to be doing fine though a few leaves have dried out. I have tomato cuttings taken from the self-sown summer plants before I took them out of the garden and these are standing by for putting into beds. Just waiting for them to take root in their water and hydrogen peroxide solution. They have barely wilted at all. Maybe 5% if that. Spinach and lettuce seedlings are coming up in pots for eventual sowing into the system. The goldfish seem to be doing okay despite the water still being a little murky. I am anticipating this clearing over time with the bacterial activity and the plant grow. In the meantime I have the water running back through a filter of cloth which is eliminating some of the dust and particles.